Hanoi is, besides from being the capital of Vietnam, a fascinating blend of East and West, with Chinese influence from centuries of dominance, and French design from its colonial past. The “Old Quarter” is a very atmospheric place to be and you could spend quite some time just soaking in the atmosphere from outside one of the many Bia Hoi (fresh beer) establisments and watching the local characters and street life… Did I mention that a beer is around 20 cent? 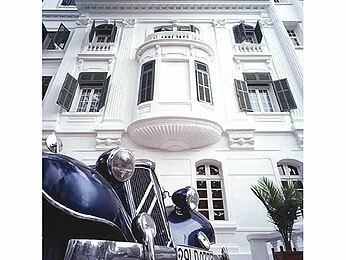 Hanoi is one of Asia's most charming cities…it is often referred to as “The Paris of The East”. You will not get bored in Hanoi…You will find a wide variety of street stands and restaurants with prices varying from 1 USD and up. You will find live music establishments in the city – and the music normally starts around nine o`clock and close around midnight. The Old Quarter, also known as the 36 streets, is a bustling area of narrow streets and home to literally thousands of small businesses and shopkeepers. If you have a weakness for silk: Hanoi is The Promised Land for silk and custom tailoring. The bargains are among the best in Asia. 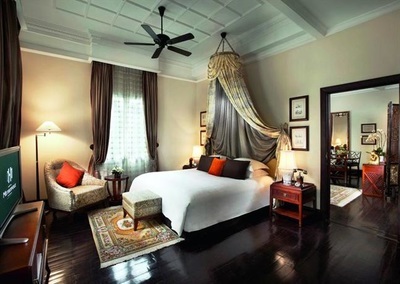 Choose your Hanoi Hotel from two to five star rating at very affordable prices. In Hanoi You could also learn how to cook - Vietnamese style. Your ﻿Hanoi cooking class﻿ will be held at Highway4 - one of the very best local restaurants in Hanoi. Highway4 is a Vietnamese culinary institution amongst locals, travelers and expatriates. Your cooking class begins with a guided walk around the famous Hang Be Street market, deep in the heart of Hanoi's Old Quarter. 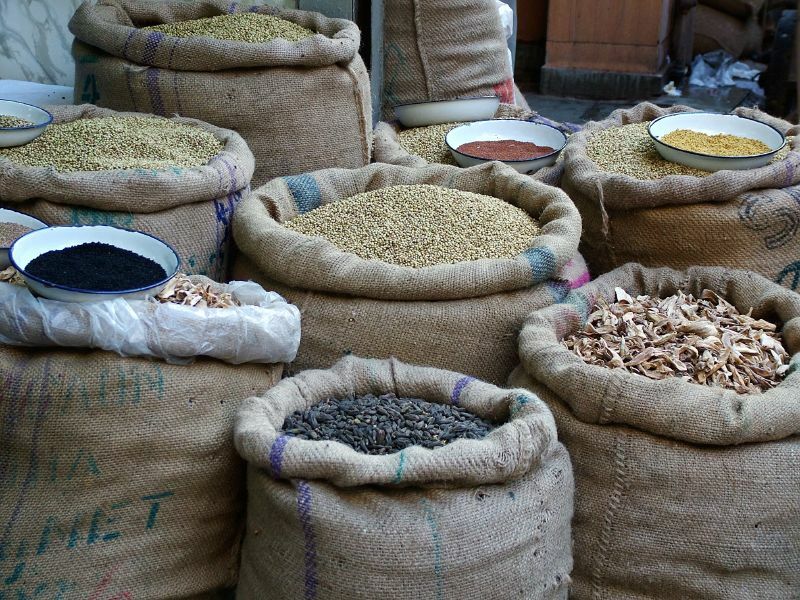 Here you will learn more about the various local ingredients including vegetables, fruits and Vietnamese herbs and spices. It was completed in 1975 and the complex contains Ho Chi Minh's mausoleum, his former stilt-house residence, the Presidential Palace and the Ho Chi Minh museum. graduates. The complex is divided into five courtyards with different paths that would originally have been reserved for the Emperor and his mandarins. One of the courtyards contains the statue of Confucius guarded by two beautiful bronze storks standing on turtles. The temple highlights the importance that Vietnamese society placed then and now on education. This museum is widely acknowledged as the best in the country and has an extensive display dedicated to Vietnam's 54 Ethnic minority peoples. The temple is set on a tiny island on the Hoan Kiem Lake, its history dating back to the 13th century. 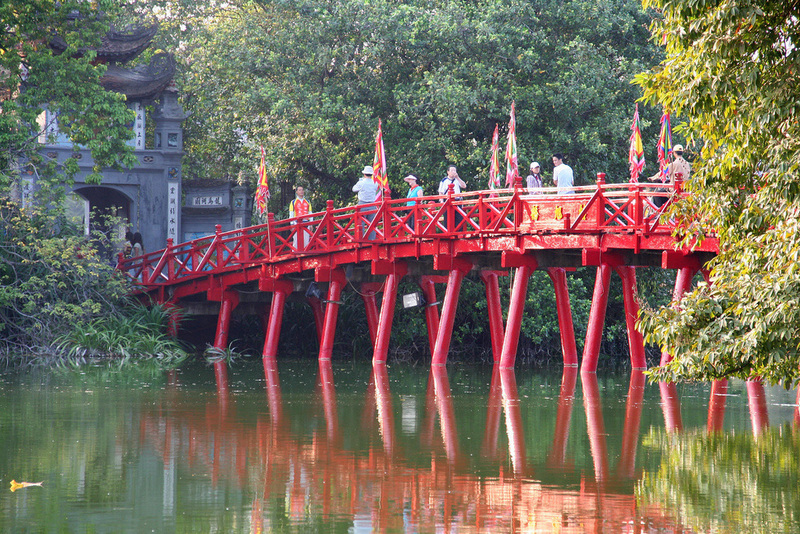 The temple is reached by crossing the The Huc Bridge which literally means the 'Place Touched by Morning Sunbeams'. If the city crowds in on you after a while – take a ﻿﻿day trip﻿﻿ out in the beautiful countryside of Northern Vietnam. You will find charming villages and stunning nature. The Ngoc Son temple, Hanoi. Hanoi gives you the best chance to enjoy the World Heritage listed Halong Bay from the luxury of a junk boat. Here you can relax on the tanning deck, swim in the clear, aqua blue waters and enjoy the best cuisine available in the bay. All the while you will be looked after by our dedicated and attentive crew. There is also the option of exploring some of the bay's most secluded lagoons using easy-to-maneuver kayaks for some unforgettable scenery only accessible by kayak. And finally you can combine your visit to Hanoi with a multi day trip in Vietnam. Whatever you do – Enjoy Hanoi. The biggest airport in northern Vietnam, serves the capital city of Hanoi. The airport is located 28 miles (45 km) from the city's downtown.